Over the past 3 weeks we have been attending Participation Workshops for Chichester Vision. We were given topics to discuss in groups. The purpose of us attending these workshops was to represent young people’s voice on the future development consultation of Chichester. We contributed our thoughts, ideas and proposals which could be used to develop Chichester further as a recreational centre that could attract more visitors to aid in the city’s economic growth. 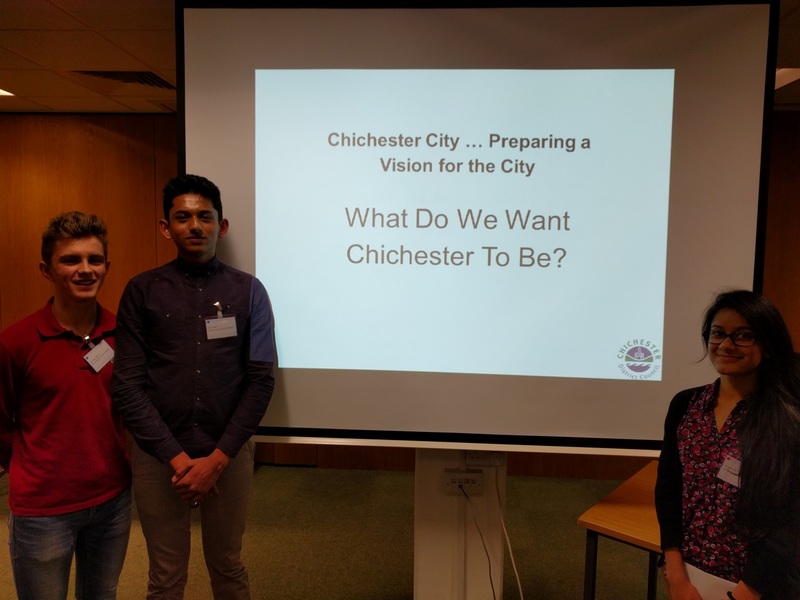 We were able to bring a youthful insight into how Chichester can be modernised and what things young people want now and possibly what they may want in the future. We looked at how Chichester can be more accessible for young people and more affordable as well as issues including transport and how business should be conducted. Many ideas were discussed such as having more independent retailers to show how Chichester is a vibrant place. Many felt that Chichester was just becoming a clone of many other cities and lacked something unique. They also felt that even through the markets (on Wednesdays and Sundays) are local, they were just not up to scratch to promote the city in a good manner. As a place to visit Sibil and George both agreed on the idea that even though Chichester has lots of shops which cater to young people and is easy to get to via public transport, there just isn’t a lot to do. Ankona also said that you can only really have fun if you bring lots of money as you can’t really relax with your friends over a nice coffee when you don’t have spare change on you. She also said that it was really hard for young people to do this as they are students and rely on their parents and what little they make from their own jobs. Sibil, George and Ankona agreed that in Chichester young people can’t do a lot of activities for free. Sibil said that young people need a place in the park where they can relax and do something, for example, younger children have rides. He also mentioned the idea of having parks meant for older children with more attractions so that would be an activity for them to do together.. An idea was also developed for young people to have a place to go to do something together like a hut or a meeting place in town with an Xbox or something for them to play together and have fun. We appreciate the opportunity given to us to participate in the Chichester Vision Project and we look forward to updating you on the next steps in the future.